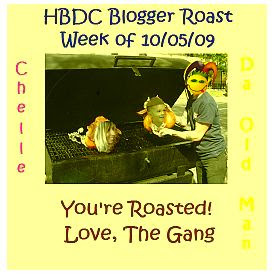 Welcome to day 2 of Roast Week at the centre of the humour blog universe Humor Bloggers Dot Com. If you missed my post yesterday, let me catch you up. The minions at HBDC are taking a shot at, erm, ah, roasting two of our fearless leeches, ah, I mean leaders Chelle B the proprietor of the site and Da Old Man her loyal fop (finicky old poop). Both are soldiering through some serious medical maladies. The third member of our trickster trinity Red Raider at Beyond Left Field isn't part of this effort. I guess 'cause he's not sick...well not physically anyway. As I said yesterday: "Today the schizoid, tomorrow the whorled." Hey, I worked hard on that line. Why can't I use it two days in a row? DOM get ready. Da Old Man hangs his shingle at Crochety Old Man Yells at Cars and, under normal circumstances is a funny, funny guy. Hell, last year he won the HBDC Blogger of the Year Award. Of course not unlike Richard Daly he voted early, voted often for himself so small wonder. He manages this and 3 other blogs from some mysterious location in the state of delusion... er, ah, must be the Tourette's...in the state of New Jersey. New Jersey? Neeew Jerrrrsey? Christ the state has two NFL teams that are so embarrassed to be associated with NJ they changed their names to the New York Giants and the New York Jets respectively. 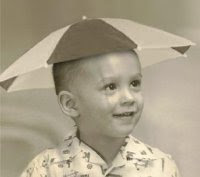 I'll give you this DOM: Frank Sinatra and Bruce Springsteen are also from New Jersey. I guess two out of three ain't bad. Gee, DOM, when I said I was going to bare all you didn't have to take me literally! This is a rarity, because DOM doesn't get out much these days. Early this past summer DOM was rushed to the hospital with kidney failure and he's been there ever since. Man, I'm surprised he's survived...the hospital food! Can you imagine three and-a-half months of institutional food? The man must have a cast iron stomach...or else he's single-handedly responsible for keeping The Surgical Shop in business this summer. DOM also almost kept the suppliers of these little marvels in business this year. His doctors told him his blood was too thin to carry him through a necessary operation to remove an infection he'd developed on his stomach. 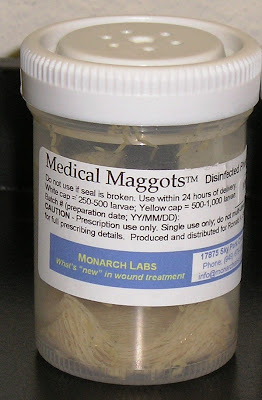 So they recommended maggot treatment. That's where these creepy little buggers are let loose in the infected area. In the end...sorry it wasn't the end it was the stomach...DOM's blood thickened up and the doctors removed 35 pounds of ugly, infected fat. No, not from under his hat! I talked to DOM at one point and asked him how he was doing. He told me he was on the same drugs Michael Jackson had been taking so he felt pretty good. I didn't ask if he was up moon-walking. Through all his troubles this summer DOM's been blogging about his progress, or lack of it. Sometimes he's had to dictate his posts to his kind wife because he didn't have Internet access. And bloggers from across North America and around the world have been waiting eagerly for his updates. I and many others have left comments on these posts throughout the summer and when he talked of how often the nurses came by to collect his blood, including several times in the middle of the night I suggested he might think of changing the name of his blog to Crochety Old Man Yells at Nurses. When on several occassions he posted about the seemingly endless screw-ups and mis-diagnoses by medical staff, I told him maybe he should call his blog Crochety Old Man Yells at Doctors. And when he was told he may have to undergo a procedure involving medicinal creepy crawlies I recommended he go with Maggoty Old Man Yells at Cars, Nurses AND Doctors! We miss you, Joe. Please get well and come back and make us laugh. Ah! Nicely done Noname! But the best part? That pic of DOM on the beach! (A little thanks to Borat, eh?) That was hilarious! Made me spew. Thanks for the mention first of all. You're right. I am not sick-yet. I haven't talked to Joe lately. Last time I tried to call was pre-op but I did not get in touch with him. If you're reading this Joe, hurry the hell up and get back on the couch will ya? Get well soon, Joe! I got to talk to him once for about 10 minutes before yet another nurse came in for him to yell at. He forgot all about me he was so busy yelling, so I hung up and decided I'd try again later. I'd consider trying again at 3am, only that seems to be a popular time for the nurses to come in as well. And hey, can you tell me what you and I and some others are doing on this site call TRiGEiA? They are pulling in my blog posts and your blog posts. Thanks for the inside scoop about Da Old Man. (Although I didn't really need the swimsuit edition.) Well done. Best wishes for a speedier recovery, DOM! LMAO! What a funny, funny roast of Da Old Man. I remember that pic from this summer....priceless. Well, done, dufus, well don. Quirks: HaHa, yeah that pic was great. I found it in his post when we did the road trip. So he only has himself to blame! Don: Hey, keep well - you're all we've got left! Yeah, I talked to him pre-op too. I should call him as soon as I figure out where he is now. Margaret: Heh, heh yeah a call at 3am oughta do it! We should all set up a schedule to call him throughout the night! That site business is weird. I never authorized it. BUT it is another method of distribution and they do tweet our posts. AND they do link to our sites. Cool but odd. There's quite a few HBDCrs there. Me-Me: Thanks Me-Me, I really appreciate it. DOM's a great guy and I hope he's up and yelling at cars again soon. I love the photos and I definitely miss Joe. My roast post should be up tomorrow. RG: Hey, thanks. I'll be sure to drop by.